In opposition to the design of sensor data management for complex static embedded systems, the support for modularity is an almost untouched field of research. Traditional architectures and sensor data aggregation strategies are based on the assumption that the sensor configuration and the application task remain unchanged during runtime. Thus, all relevant characteristics concerning the components and application environment can be included in a static layout process. Even though such a methodology is suitable for a large class of systems, others suffer from the lack of flexibility that arises from the insufficient support for modularity that results in data conflicts due to unhanded measurement redundancy and poor expressiveness of high-level results. 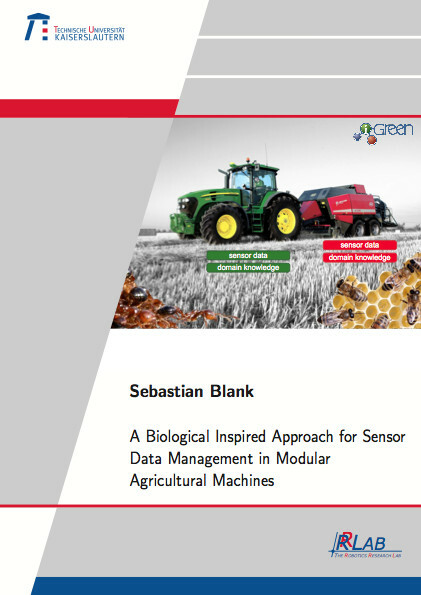 An excellent example for this can be found in modern agricultural vehicles that rely on modularity in form of a combination of multi-purpose and task-specific machines to achieve a common task. Therefore, the focus of the work at hand is to derive new methodologies to address the effects exhibited by this domain. This effort is based on two major aspects that span the architecture and the multi-level fusion algorithms. The central pillars that both aspects rest on are the principles for aggregation and interpretation found in the biosciences. While from an architectural perspective distributed information management and early source abstraction as found in higher animals and humans are the key factors, the low-level fusion algorithm employs the idea of collective decision making with partial knowledge as found in swarms of social animals. In total the proposed design consists of three functional layers. While main functionality of the bottom one is hardware abstraction and integration of distributed component and domain knowledge, the two top layers take care of signal-level fusion and high-level information aggregation and interpretation with the ultimate goal to enable context specific and robust data aggregation and interpretation. The strategy to achieve this in a way that the resulting setup is both flexible and lean is to combine deterministic and probabilistic reasoning methods. Thus, a fuzzy classification method can be amended with a Hidden Markov Model if needed to allow for more advanced classification tasks.